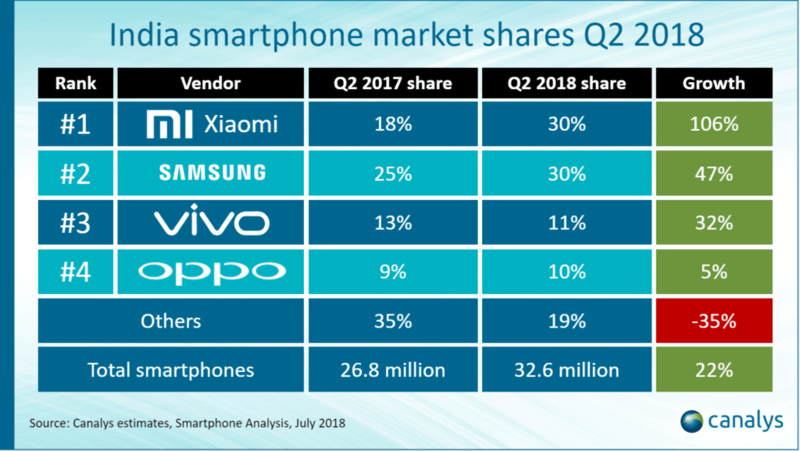 The top two smartphone brands in India- Xiaomi and Samsung, each said to be shipped 9.9 million smartphones in Q2 2018. According to the shipment tracking firm, Canalys, this is the best quarter either vendor has had in the country. Together, the two companies now account for 60% of total shipments in India, up from 43% a year ago. Both the brands now has 30% market share in the country, but Samsung is slightly behind Xiaomi says Canalys. Samsung’s annual growth rate, at nearly 50%, was the best its been since Q4 2015, leaving it a hair’s breadth behind Xiaomi in second place, said Canalys in a blog post. Vivo took the third place with 3.6 million shipments while Oppo is in the fourth position with 3.1 million shipments respectively. The overall shipments in Q2 2018 grew by 22% to just under 33 million units. “Samsung is hitting back,” said Canalys Analyst TuanAnh Nguyen. Furthermore, based on Canalys smartphone sell-in estimates, the Samsung Galaxy J2 Pro was the company’s best-selling device in Q2 2018 with 2.3 million units shipped in the country. On the flip side, Xiaomi shipped 3.3 million units of Redmi 5A during the quarter. 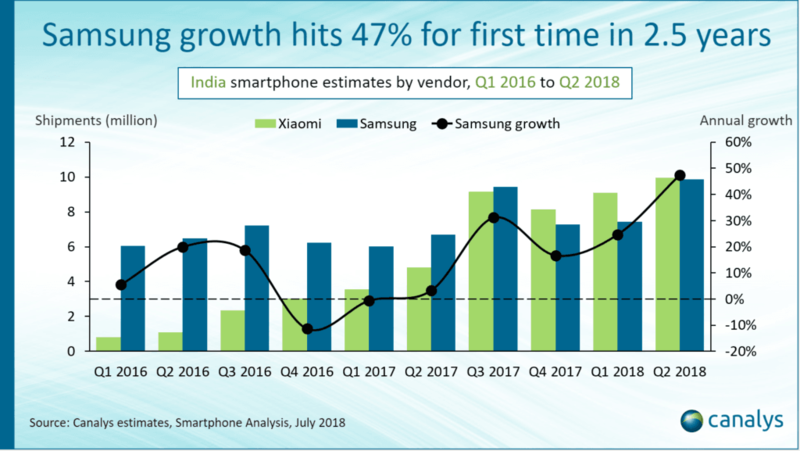 “Despite Xiaomi’s growing popularity in India, Samsung will remain the first choice for consumers. Its technological prowess and supply chain mastery will continue to give it an edge over Xiaomi for the foreseeable future,” said Canalys. In recent times, we have seen some brands such as Asus and Oppo reworking on their business model. Canalys revealed that shipments of Asus almost tripled since the previous quarter. “Volume is not the only strategy in India,” said Canalys Research Manager Rushabh Doshi. “Samsung and Xiaomi often distract from the opportunities that India has to offer smaller and leaner smartphone vendors looking for additional business opportunities. The climate is right for businesses to realign and re-enter the market. Apple’s iPhone shipments to India fell by about 50% in Q2 2018. But Apple is paring back of distributor partners and move to a ‘brand-first, volume-next’ strategy will reap rewards as it will ensure better margin per device. Getting priorities right will be important to smartphone vendors, and it will be a choice between profitability and volume growth,” Doshi added. After losing the battle to Xiaomi in the last two quarters, Samsung is getting back into the winning ways. Even though the smartphones from Samsung are nowhere close to what Xiaomi offers, people are still purchasing them, thanks to the company’s marketing and bigger offline reach. Last 4 years I have been using 3 Xiaomi phones. Did not have to visit arrive centerat all. Just need to take care not to drop phones on the floor and invest in a bumper case….and while flashing or updating ROM always use fastboot method using PC.